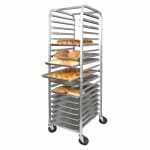 The Winco ALRK-20 sheet pan rack holds baked goods as they cool, stores product in walk-ins, and proofs dough. Accommodating tall products, the runner spacings sit 3 inches apart. Since the rack includes 5-inch-diameter swivel casters, it can move smoothly. 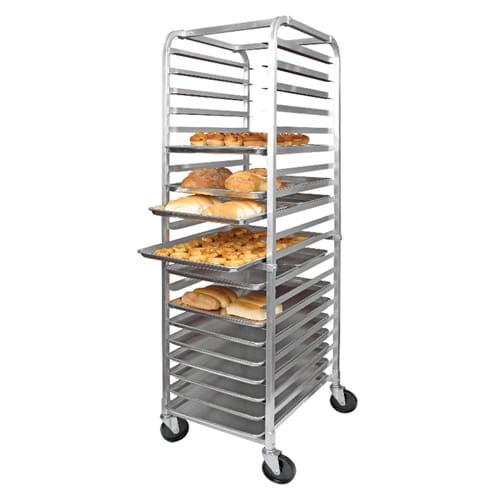 This Winco ALRK-20 sheet pan rack can hold (20) 18-inch by 26-inch sheet pans or (40) 18-inch by 13-inch sheet pans. Take an in-depth look at these units in our storage rack article.